SEI co-sponsored its first crisis simulation with the Woodrow Wilson School Office of Graduate Career Services in February, 2010. Designed and run by a government intelligence agency, this simulation called on students to develop a series of policy recommendations in response to a crisis on the Korean peninsula. Nearly 60 undergraduate, masters, and PhD students took part in the day-long event. SEI hosted its second simulation in April, 2010. 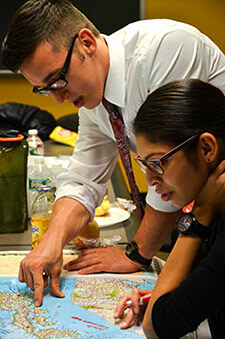 Based on a nuclear crisis scenario this simulation called on students to represent diplomats, military officers, and chief executives from China, India, and the United States. Based on the success of these inaugural events, SEI sponsors two simulations each year, one held in the fall semester and one in the spring semester. The simulations are open to all Princeton undergraduate and graduate students, regardless of year or major. In recent years, the simulations have expanded to include participants from the U.S Military Academy, the U.S. Naval Academy, and students from nearby universities. The topics of past simulations have included conflict crises in Syria, Eastern Europe, India and Pakistan, Korea, the Asia-Pacific, and US-China-Russia relations.